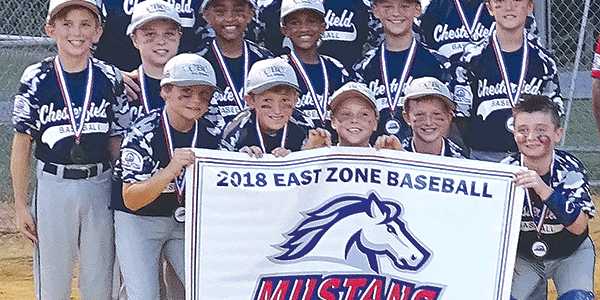 The Chesterfield Baseball Club 10U Mustang All Stars traveled to the PONY Virginia State tournament in Windsor, Virginia June 23-25 where they went undefeated and won the state title. The team’s bats were on fire. They scored 75 runs while only giving up 27. 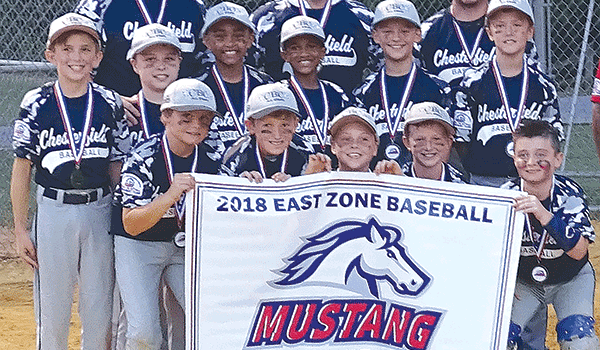 Top row from left – coach David Lipes, manager Mark Lindsay, coach Jay Lipchak; middle, Nathan Berry, Landon Lipes, Tai Bowler, Kristian Geter, Jack Gasiorowski, Cooper McCormick; bottom, Owen Rogers, Blake Lindsay, Riley Royster, Caiden Jones, Logan Lipchak.